Did you ever finish watching a movie, and only after it was over you said to yourself, "what in the heck did I just watch ? "....but somehow you were oddly content with what you had just seen ? 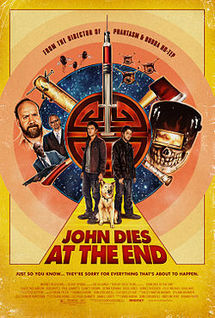 I hope I didn't confuse anybody with that little bit of Q&A there, but that's what John Dies at the End will do to your mind. As I popped the disc into my player solely based on the notion that I really enjoy director Don Coscarelli's work (Phantasm, Bubba Ho-Tep), what I was about to see was an all-out assault on my senses and brain activity. In the film we are introduced to David Wong, a slacker with a very interesting story to tell (boy, is THAT an understatement) - he is joined at a dumpy Chinese restaurant by journalist Arnie Blondestone (played admirably by Paul Giamatti). Davis is exhibiting serious side effects from being on "The Sauce", a black, viscous, almost conscious drug that comes in either syringe or pill dosage. This drug can make you see and predict things that haven't even happened yet....sounds good right ? Both of our "heroes" have to get to the bottom of why this drug has ended so many lives in such a short period of time, and why does the people that are still living acting like they are from another planet ? Here now is where I offer somewhat of a disclaimer: I don't like to reveal too much about a movie along the lines of storyline or dialogue offered, however I feel that I could type into the wee hours of the morning and you as a viewer would still not fathom all that there is to be seen with one (or multiple viewings) of this psychadelic sci-fi/horror mindbender. What I can offer is just a small listing of some of the visuals that are thrown at your eye sockets when you hit the "play" button on your DVD unit...a giant monster created solely of meat products that were assembled out of a freezer unit, alien sluglike leeches, flies that burrow into peoples' faces in order to dispense the "soy sauce" toxin into the bloodstream, a gangster wannabe that has been posessed by aliens that wants to be referred to as "shitload", the aforementioned bratwurst cell phone, and a loveable mutt that may just be the universe's ultimate savior. When all is said and done, all I can recommend is that you should RENT this first, strictly to see if you could get into it before you commit to buy. There is a resolution to the ending of this film, but whether you will find it satisfying is undeterminable. It's best to black out the windows, settle in, clear your mind and just watch.....but PLEASE....don't attempt to figure this one out.....you'll just end up hurting your skull in the process. I saw it in the theaters. It's definitely a movie that needs to be seen with a crowd. I loved, it has a nice mix of horror and comedy, I would say it's this years Cabin in the Woods.